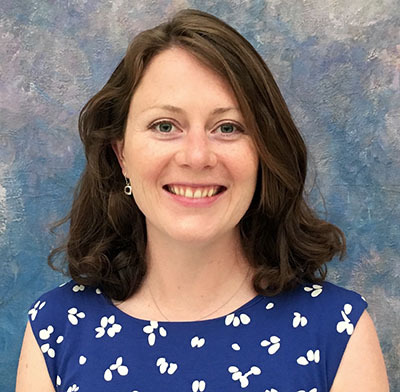 This month's newsletter includes important kudos for a well-deserved Student Chapter Award and a call for volunteers to engage with a new SSIT initiative to tackle Standards Development. Several excellent Conference and Publication opportunities also appear below. As always, if you have a news item, SSIT-related update, volunteer opportunity, CFP, award notice, or idea for a "Feature Article," please contact me at Heather.Love@usd.edu. Submissions for the December 2017 newsletter are due by 20 November 2017. 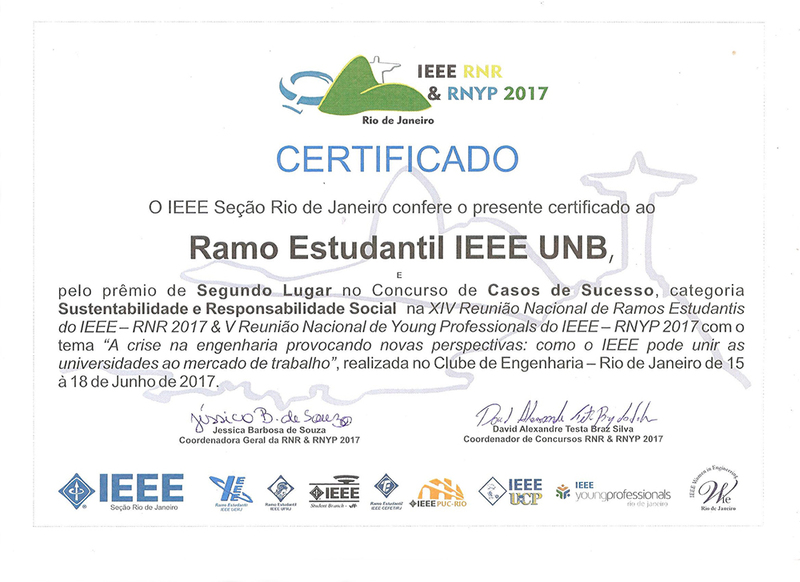 Congratulations to the members of the IEEE SSIT Student Chapter of the Universidade of Brasilia (UnB) Centro-Norte Brasil Section, who received the "IEEE R9 Exemplary Student SSIT Chapter" award at the IEEE Student Branches Meeting of Latin America 13 October 2017 in Cusco, Peru. This achievement is particularly impressive, given that the group was only formed in February, 2017. The Chapter has started strong, promoting humanitarian actions based on the United Nations's sustainable development goals for 2030. This year's SSIT UnB Student Chapter events have included: a hair donation for people with cancer, September Yellow activities to promote mental health, and a blood donation to celebrate IEEE Day 2017. In addition, the chapter has promoted a contest called Sustainable Cities Ideas to solve problems of Brasilia. On the technical activities front, the chapter developed two projects: "Signal" and "Recreate." "Signal" is a methodology to teach App programming for deaf students in public schools; "Recreate" is evolving to be the UnB recycle center for electronic waste. The group began when students at UnB who were involved with projects related to environmental issues, humanitarian technologies, health, and well being decided to create the SSIT Student Chapter to increase their positive impact on society. 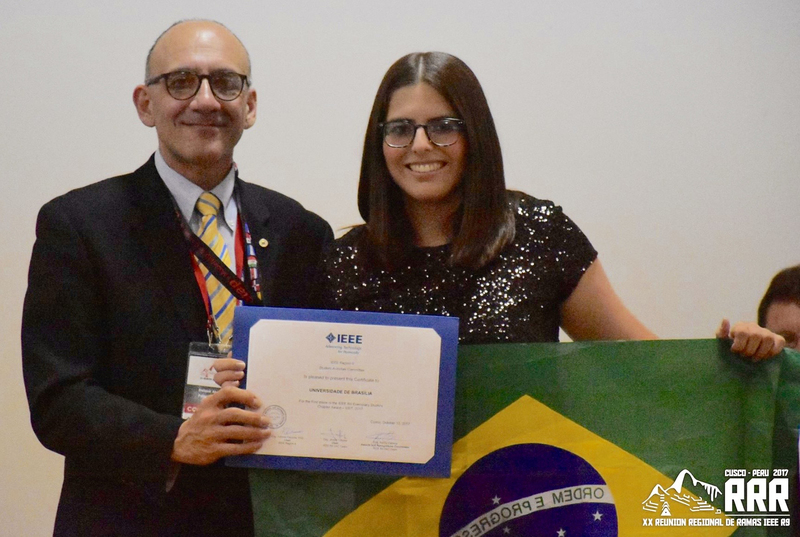 According to Pamela Oliveira, chair of the chapter, the IEEE Student Branch offers many opportunities to volunteer. SSIT volunteering is important, she adds, because engineers should worry about the implications of their work on the environment and humanity. The group is especially happy and proud about their achievement after less than one year of projects. This is just the beginning; they hope to grow even more and continue being a strong presence in Latin America. Read the full story on the SSIT Blog. On 28 September 2017, SSIT was approved as a Standards Sponsor. This initiative was spearheaded by former and current SSIT Chairs, respectively, Greg Adamson and Paul Cunningham. A major catalyst to this effort was the IEEE Global Initiative for Ethical Considerations in Artificial Intelligence and Autonomous Systems. SSIT Standards Committee (SSIT/SC) will enable SSIT to develop relevant, useful, and needed standards within our key areas of interest. Because SSIT's scope of interest in standardization concerns how technology impacts the world, as well as how the application of technology can improve the world, the Sponsor is anticipating cross-Society collaborations, with engagement from a cross-section of stakeholders from across IEEE, especially given that ethics, sustainability, and social implications exist in the context of a particular technology. SSIT will be developing standards for engineers to guide them into better awareness of the issues at stake, the potential for unintended consequences, and the need to design them out of their engineering processes, products, and services. Future SSIT/SC standards will be equipping engineers with the guidance to address the risks and opportunities that accompany technology and preempt any negative impacts on our world. Good governance that evaluates and balances outcomes against risk while deploying ethical considerations—such as sustainability, inequality, human dignity, safety, security, and inclusiveness, in other words, considering a first do no harm approachis another step in this direction. SSIT's Sponsor committee is seeking SSIT members to join our committee and participate in the evolution and development of standards within our scope of interest. If you have a passion for standards development work, please apply for membership. The Sponsor is seeking diversity amongst the members, both in terms of the mix of Societies represented as well through geographical representation. Previous standards development experience is an asset. Prospective members are encouraged to become members of an IEEE society, but it’s not a prerequisite to participate. If interested, please email your request for SSIT/SC membership to the Chair at vhailey.iso@gmail.com. Include in your request your reasons for joining, your resume, and the contribution you expect to make to SSIT/SC. The 9th International Conference on Ethics in Biology, Engineering, and Medicine will be held at the Florida International University (FIU) in Miami, FL, USA, 14-15 April 2018. Abstracts should be submitted by 15 November 2017. This conference has been endorsed or technically co-sponsored by IEEE/SSIT and many other professional societies and institutions. Note: the sponsors will pay for the conference registration including all conference meals and events for one presenter for each accepted abstract. In addition, we will have limited funds available for travel subsidies (the application included in submission form).